The architects of Bulgarian office Another Studio removed walls from an apartment and replaced them with customised shelving systems to create themselves a personalised workspace. Studio founders Andrey Andreev and Petya Nikolova, who usually favour minimalist style, wanted to create a homely workspace where they could be comfortable all day, in order to maximise their productivity. 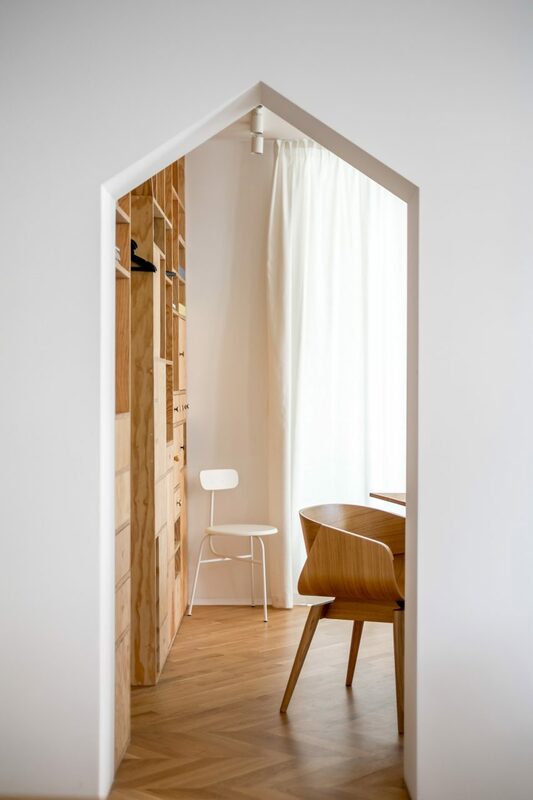 Having recently spent some time in Japan, they wanted to recreate the “purity and serenity” of Japanese architecture, with a pared-back finish of flexible, semi-permeable partitions. 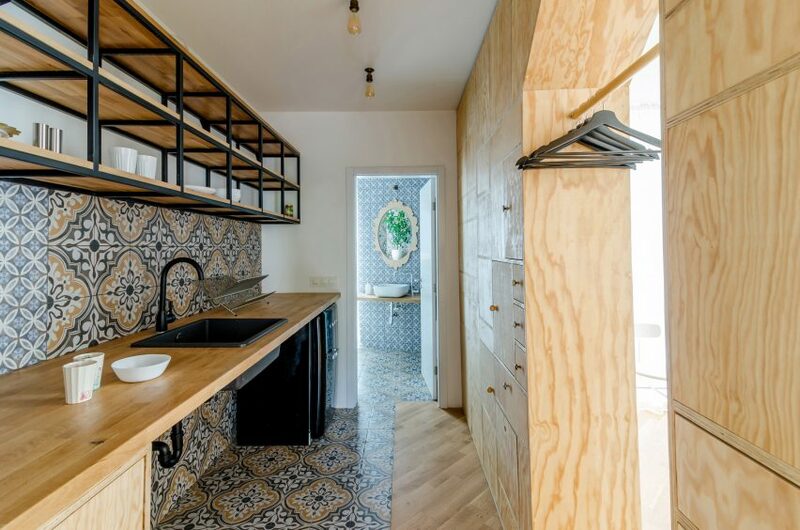 To achieve this, they removed all load-bearing walls of the former apartment in Sofia to transform it into an open-plan studio. 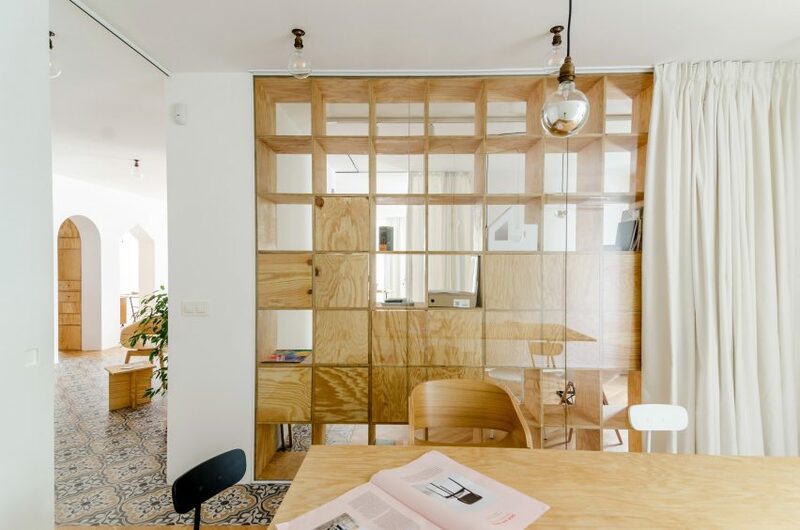 They then used plywood to build new partitions, which integrate a mix of shelves, cubbyholes, drawers and cupboards. As these feature openings, they ensure that different areas are visually connected. The architects also added translucent white cotton curtains so that spaces could be further separated if necessary. “We believe one of architecture’s main tasks is to make connections,” Nikolova told Dezeen. 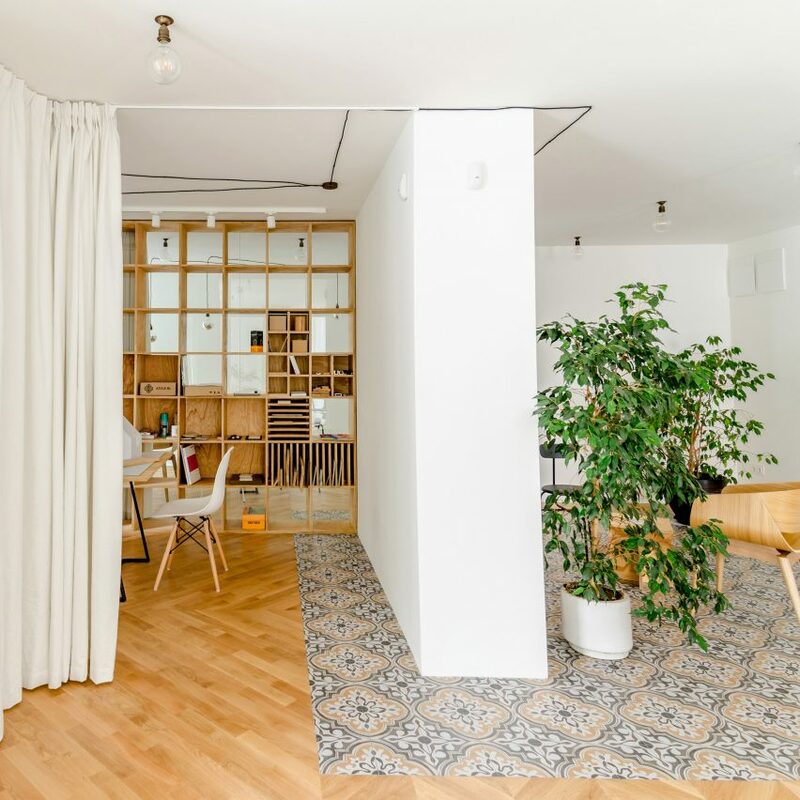 “So in the case of our workspace, considering its size and specifics, we decided to demolish almost all non-bearing walls and use other elements – curtains, libraries, a sliding door – to define the different areas without actually separating them,” she continued. The studio comprises two main work areas, a space for physical modelling, a meeting room, a kitchen, a bathroom and two terraces. 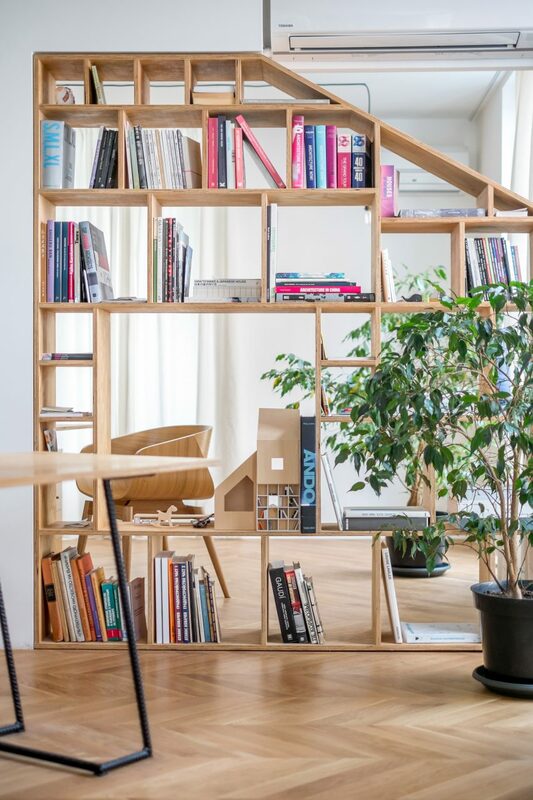 The plywood bookshelves double as furniture, to make the rooms as space-efficient as possible. Between the meeting room and modelling space, the bookcase hosts removable elements that form seating and side tables when required, and the unit separating the kitchen and studio space has a built-in coat rack. Flooring differentiates the rooms, from various arrangements of oak parquets to decorative ceramic tiles. These tiles are intended to resemble carpets scattered in the space, creating a homely atmosphere. The architects chose a variety of seats for the space, including both mid-century and contemporary designs. A key furniture piece is the large central desk, which consists of three modules assembled in a Y shape to make space for five or six people to work together. Other details include large pot plants, large low-hanging light bulbs and doorways with pointed arch shapes. 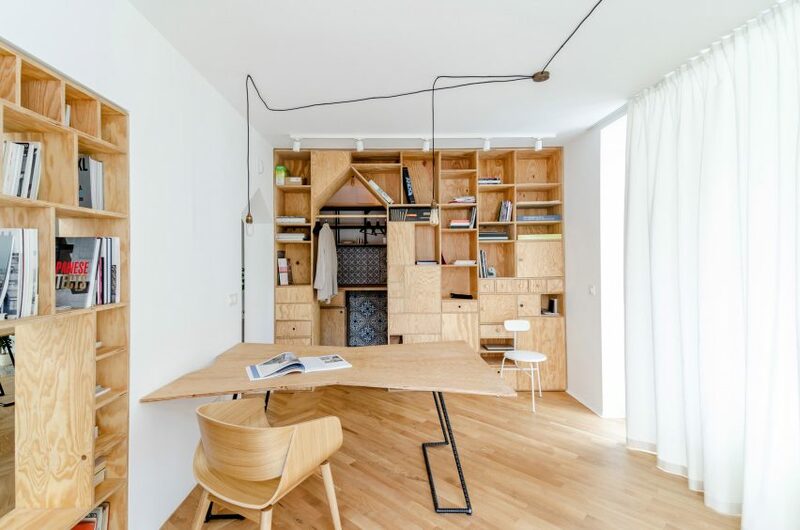 Andreev and Nikolova are the latest in a series of architects to come up with creative storage solutions for their own studio.